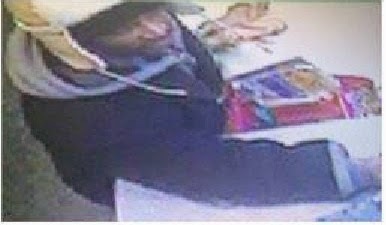 Surveillance photo of the suspect robbing Plato's Closet on Saturday. UPDATE 9:09PM: Police have issued a community alert regarding this crime. Our original report follows, with surveillance photo added. The hustle and bustle of a major 3-way intersection did not dissuade a man from robbing a Lake View clothing store at gunpoint in broad daylight yesterday. 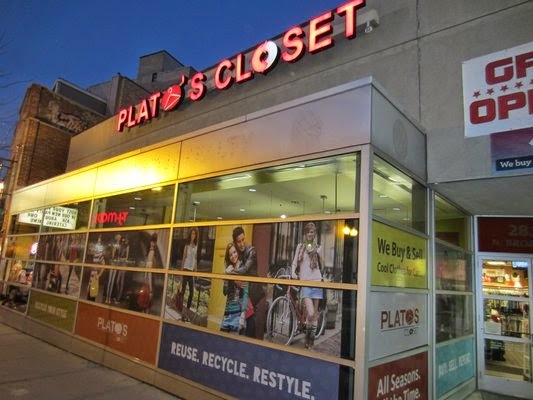 Police were called to Plato's Closet, 2817 Broadway, just after 10:30AM by the store clerk who said a man pointed a small black revolver at her and took about $900 from the store's cash register. An unusually-robust police search of the area around the Broadway-Clark-Diversey intersection failed to locate the offender. The suspect is described as an "older" black man between 5'10" and 6-feet tall, with a thin mustache, a "flat nose," and average build. He was reportedly wearing a tan and cream-colored "Elmer Fudd hat" with a dark wool trench coat, jeans, and white gym shoes. He was last seen walking southbound on Broadway toward Diversey. Police met with a strong arm robbery victim who called for help from the Taco Bell across from Wrigley Field around 2:30 Saturday morning. The man told officers that was walking in an alley near Taco Bell when two men approached him from behind. One put the victim into a chokehold and the other took his iPhone and wallet. Both offenders were men in their early 20's, described as black, about 5'7" tall, wearing dark hoodies. Case number HY158552.